Hiccup's debut is a bittersweet dance party. 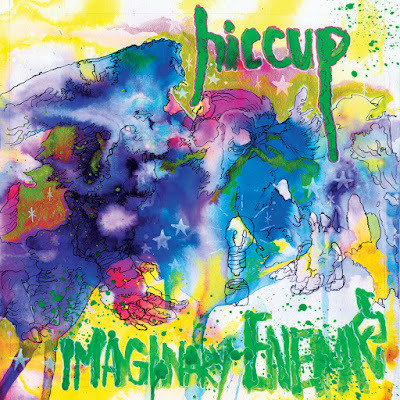 Hiccup’s debut release, Imaginary Enemies, is a strong introduction to the trio. The songs are driven by powerful and noisy guitars, dragging brokenhearted and romance-drenched lyrics along for the ride. Hallie Bulleit of The Unlovables is a star songwriter on this album, and her characteristic lighthearted hooks shine through on her new project. Poppy anthems like "Lady Macbeth and Miss Havisham," "Yeah," and "Better" are shining examples of these addictive sing-along choruses. Every moment of this release is a bittersweet dance party. Energetic drum fills, upbeat, jangly guitar solos, and fast-paced, propulsive riffs rush into your ears and pulse through your fingers and toes while the lyrics keep you grounded with melancholy diction and vulnerable imagery. “Better” stands out as an especially emotional track blended with a shockingly lively background. Bulleit sings, “And who can say what chased the pain away… did how he made me feel make me ok?” as she searches for independent validation of her own feelings. The song conjures up imagery of delicate forces of nature, mentioning weeds, water, and the ocean in relation to Bulleit’s experiences. All the while, a high-pitched vocal hook hums sweet “oo’s” alongside a dynamic guitar riff. “Enemies of Friends” is a unique addition to the album - it's driven by the simple and pleasant strumming of an acoustic guitar, while the lyrics give it a more bitter and sentimental vibe. The harmonies are ghostly in comparison to the pulsating and animated background vocals on the rest of the album. There's an eerie guitar sliding around behind the vocals to complete the sober and wistful mood. The album wraps up with the most punk-influenced two minutes on the album, a track called “Neverwhere.” Bulleit’s voice in this song is loud, sharp, and abrupt like a series of powerful punches. It even throws in the classic punk pogo beat. Even though Hiccup sounds a little more raw on this track then the others, they stay true to their love of poppy hooks and sweet harmonies that make this album so wonderful. Listen to Hiccup on bandcamp.